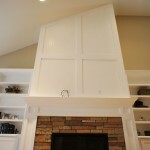 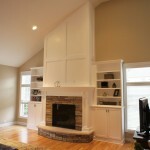 This beautiful home really needed a focal piece to reside on it’s enormous vaulted wall of the family room. 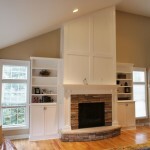 The addition of a large new fireplace, custom cabinetry and a gorgeous trimmed full height enclosure gave it just what it needed! 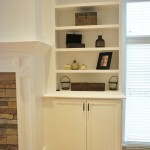 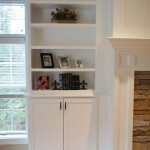 The cabinets allowed us to fully conceal all of our clients electronics while the bookshelves gave them a place to display their family photographs. 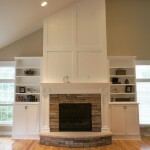 The decorative mantle is adorned with classic paneled columns and large crown molding to accentuate it’s scale in relation to the fireplace. 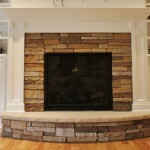 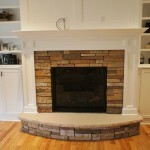 The one of a kind limestone hearth was shaped to our exact specifications to compliment the cultured stone surround. 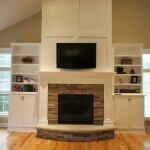 With the click of a remote the family can enjoy a nice warm fire and watch their favorite TV shows or movies!